Since the introduction of multi-platform POS ecosystems, just-in-time delivery and asset management label printing technology has played a key role in the identification of products to allow easy documentation and management. In industries such as hospitality, companies come under pressure to improve data collection and reduce errors, many are quickly moving away from the traditional pen-and-paper based processes and are investing heavily in technology to increase productivity and efficiency. For example, in areas such as fast food, where its time management and order processing is imperative, staff currently struggle attaching order bills to cups, bags or wrap causing inaccurate data processing and missing orders. This issue is not just confined to hospitality. Retail distribution, logistics and warehouse businesses also have re-occurring issues trying to increase work productivity while printing. Many citing issues attaching different types of invoice labelling to their products.To resolve these issues, BIXOLON has developed a Linerless Labelling solution with B-linerless™ and Taken Sensor™ Technology. Enhancing work productivity: Providing greater flexibility, linerless labels offer an ecological alternative to traditional label media. Allowing easy-to-use drop-in paper loading, Linerless labelling enables the possibility of providing a label of any length with the ability to still provide a clean cut without label gum build-up. Lower TCO: Removing the waste of silicon backing liner paper originally used in labelling, linerless rolls offer double the number of labels per roll, decreasing the number of roll changes. High Quality: Compatible with BIXOLON’s high-quality printers insures a long time use without jamming errors. Eco-friendly: Eliminating the waste bi-product of silicon liner backing paper, linerless labels help reduce paper waste. Why choose BIXOLON’s linerless labeling solution? 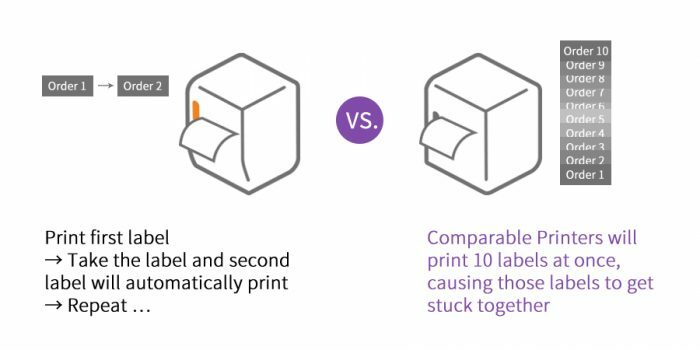 Linerless paper typically has a reduced amount of adhesive spread across the media compared to traditional heavy adhesive paper which leave residue on a printer mechanisms and can cause paper jams during continuous printing. To counteract this, BIXOLON has installed Anti-Jam Technology in the SRP-S300. This technology provides special paper path design, an automatic guillotine cutting system with a revolutionary platen roller and sub roller designed with rubber material. Alongside BIXOLON’s Taken Sensor™ Technology which can calibrate this issue and make the linerless system run smoothly and effectively, by limiting linerless label printing until the current label has been removed. 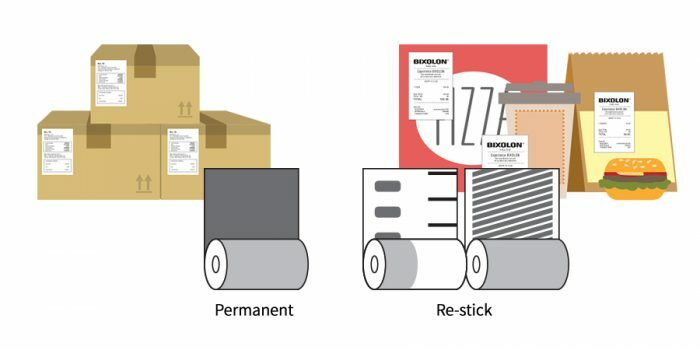 With these unique technologies, BIXOLON’s solution is compatible not only light adhesive linerless but also heavy adhesive linerless label printing differently from comparable solutions on the market. For more information visit the SRP-S300 webpage or contact your local BIXOLON sales representative.